Example: Filled on site Preciquant™ Injector for drugs with luer needle system. Device is filled in front of the patient, just before it is applied. 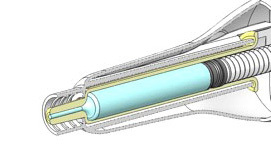 Identical to a standard syringe pumping out from a vial. Precise dosage is required once or regularly. Injector if mounted with a needle, painless if necessary. Doser if equipped with a nozzle. Distributes liquids, liquid drops, cream, gel and paste. Examples: drugs, hormones, antibiotics, vaccines, radioactive products, special treatments, anesthesia and vitamins. The AutomInject™ patented technology allows the Preciquant™ Dispenser - Doser - Injector to deliver a precise dose each time you press on the lever. It is a full automatic dose per dose delivery from the first to the last dose. AutomInject™ produces a « click » sound after every dose, allowing the practitioner to effectively monitor the correct dosage: 1 click = 1 dose. The treatment is thus greatly simplified to a click based procedure. The device can deliver from 1 up to 200 clicks. Number of clicks is linked to the application. SmoothJect™ patented technology allows painless injections if necessary. The Preciquant™ can either have a needle mounting system for injections or a specific nozzle shape with or without cap when used as a dispenser for product delivery. Nanodroplets™ patented technology allows to uniformly cover a surface with droplets. Size of droplets and spray angle can be set from a catalogue of different spray nozzle. The patented Preciquant™ Injection system expels liquids, gels or paste. This is made possible by the lever that multiplies the injection force and allows a comfortable, strength free, dose per dose delivery of the product. For more information see Preciquant™ technology page. For more information on available options see Preciquant™ technology options page. The Preciquant™ Injector – Doser is adapted to the customer's current manufacturing process. It can be integrated in the process without requiring a new qualification and validation of the process. In some medical products the manufacturing process is strongly linked to the container (primary packaging) that can be for example a glass vial or a cartridge. For this kind of specific application there is a version of the Preciquant™ where the front part is no longer the container but becomes a container carrier (secondary packaging), such as for the dental anesthesia application. The device can either be delivered in bulk, assembled, filled, packed, boxed, clean or sterile. The manufacturing, filling, assembly and packaging can be made by Primequal, a sub-contractor of the customer or by the customer himself based on a license. Primequal can process the device in ISO clean rooms (8, 7, 5) and through multiple sterilization technology. Preciquant™ is based on conventional biocompatible materials to avoid any discomfort or risk to the patient. Each material is tested and certified according to ISO / FDA biocompatibility requirements. Preciquant™ is based on standard common materials that are fully recyclable. These materials require only a little heat to become a syringe and again a little heat to revert into raw material. Preciquant™ is designed to have the lowest raw material weight possible and this requires the most advanced engineering and manufacturing process. All our Preciquant™ delivery systems are adapted to the customer's needs and more specifically to the end user's usual practice. Feel free to contact us to submit your application.